The configuration of the top search form: Search minivan or minibus vehicles at the rental location 'Bergamo - Airport'. Address: Orio Al Serio Airport, Bergamo, I 24100, Lombardia, Italy. - use the map of Bergamo. Typical models of the minivan/minibus class in Bergamo are: Ford Galaxy 7 seater, Mercedes Vito, Peugeot 807 7 seater, Citroen C8 Tdi, Citroen Picasso, Mercedes Viano 8 Seater and others. Minivan dimensions are quite unusual for an ordinary driver, which sometimes leads to appearance of scratches and dents during unsuccessful manoeuvring or parking. Therefore, we encourage you to order full coverage of insurance franchise during your booking, or directly at the rental office in Bergamo. Before leaving the parking garage in Bergamo, inspect the minivan for exteriour defects and other signs of damage together with the office representative and mark the found defects found in your rental documents. Drivers should be more attentive when traveling to southern parts of the country. Valuable items should not be left in cars. Burglars can be attracted even by an empty bag left on the front seat. If there is a sudden breakdown on a highway, you can use the services of Automobile Club d'Italia. Simply dial 116 and wait for help. It should be noted that the services of the automobile club are not cheap. Tourists, who plan to spend a lot of time in the country and make many car rides, are even recommended to join the club. In this case, you can count on good discounts. As it has been noted above, local drivers are not distinguished by a diligent compliance with the traffic regulations. They have found rather an original way to "bypass" the need to fasten seatbelts all the time. Many drivers wear an original t-shirt, the front of which is decorated with the image of a fastened belt. 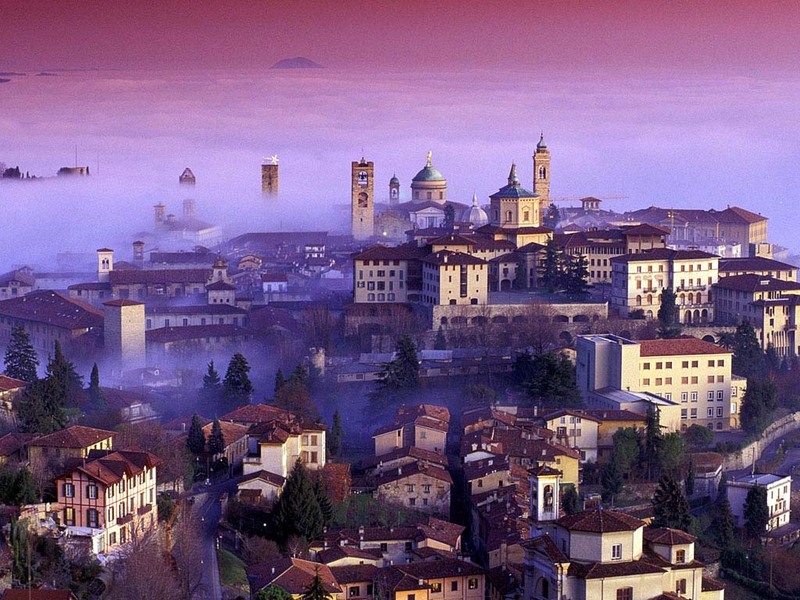 There is a legend that tells about wonderful city Bergamo and its creation. According to this legend, the city was founded by forefather Chidn, but this place got its splendid forms after the World War II. However, the city is full of famous sights and places of interest that actually prove old history of Bergamo. When we start talking about this city, we should definitely mention its rich historical heritage. The city is simply full of various sights. 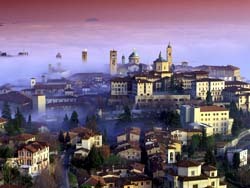 For example, a popular and frequently visited sight is an ancient square that is also considered the heart of Bergamo. Here we should pay your attention to the fact that there is an enormous number of architectural ensembles created in the period of Renaissance in Bergamo. You will find here amazing medieval town halls, the town library, or the square near the cathedral. This square is also the location of another famous object – the Basilica di S.Maria Maggiore. The church is one of the oldest historical buildings. Also don’t forget to visit opened and fascinating Roman portal and Cappella Colleoni – they are all can be found on the same square. Finally, when you’re done with these sights, it’s time to visit the palaces that once have been owned by noble people in Bergamo. These are Moroni, Terzi, Medolago-Albani, and Alvari palaces.